Specific ostomy wrap and underwear for girls. 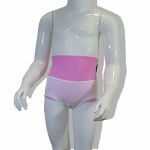 This exclusive product combines a true ostomy wrap with a pair of intimate slip to give your little girl a comfortable, practical, and convenient solution to protect your child everyday and make your ostomy pocket discreet. 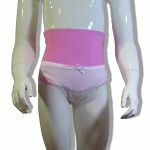 It is suitable for all types of ostomy (colostomy, ileostomy, urostomy) and also for ostomies positioned both on the right and on the left.